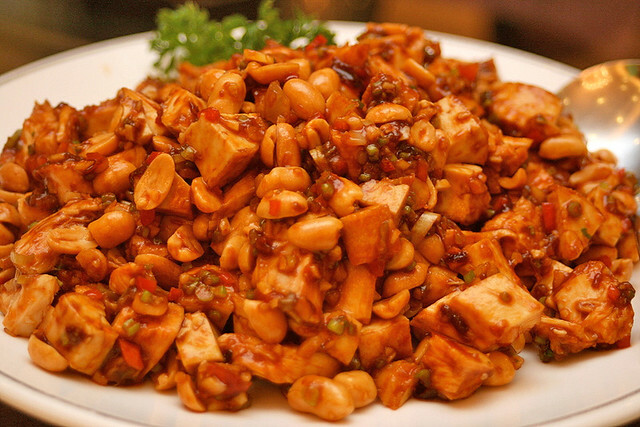 A very savoury chicken dish with peanuts. Very appetising starter. Don't worry, it's not as spicy as it looks! Cold Pig's Hock and Foot in Wine Sauce. I was a little hesitant to try this, even though I love pork trotters when braised. But wow, a tiny nibble led to more. This is delicious, especially the almost crunchy skin. 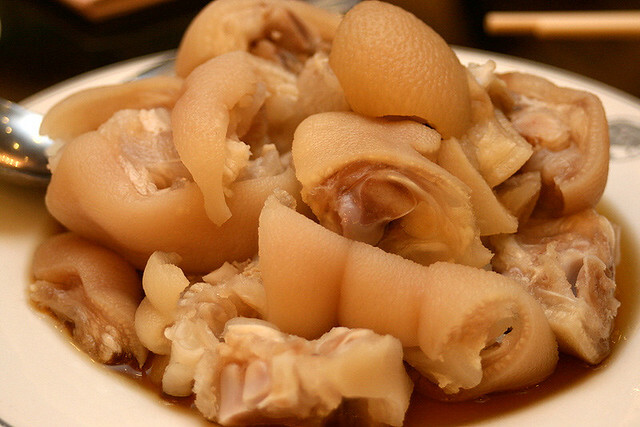 The vinegar, soy and wine made an addictive combination. 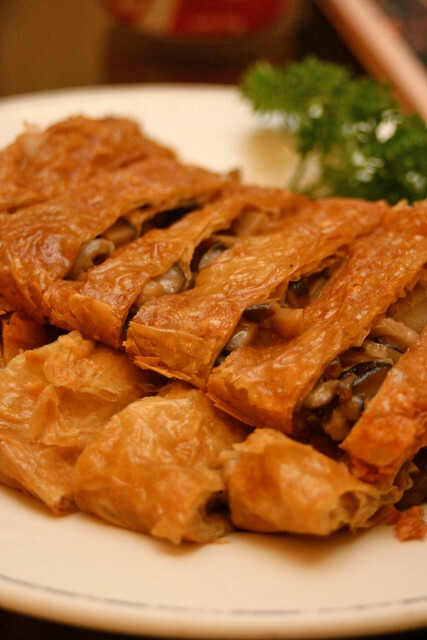 Beancurd rolls stuffed with vegetables and mushrooms. Gorgeous savoury flavours with meaty mushrooms. So umami! I wonder if this is the vegetarian goose on the menu. 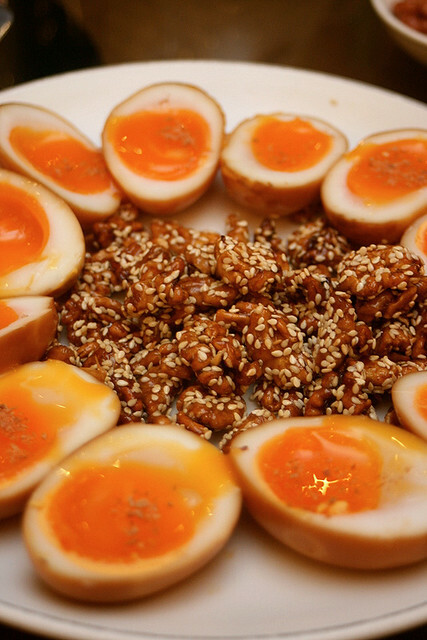 Smoked egg with walnut. Those who love runny yolks will adore this. 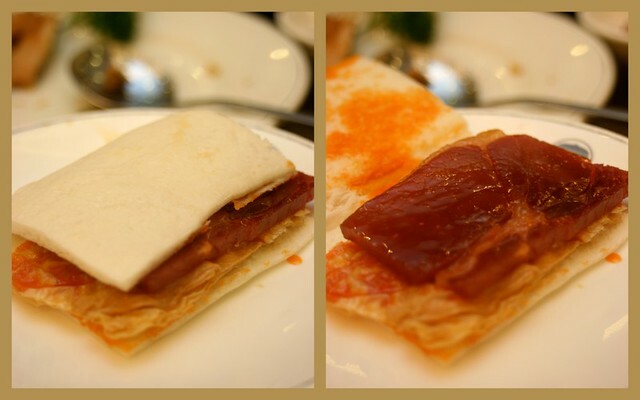 Honeyed ham with crispy beancurd sheet wrapped in bread. Salty and sweet, chewy and crunchy. Strong pork flavour in the ham. 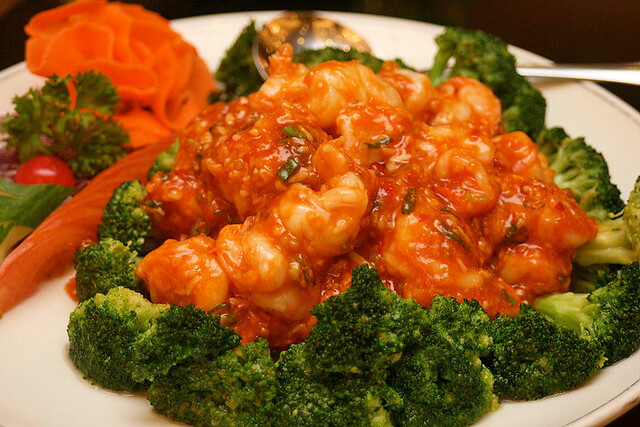 Stir-fried prawns in chili sauce. 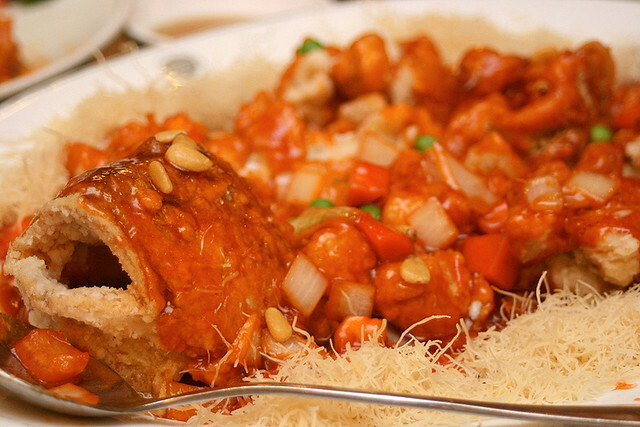 Yes, it's a bit like chili crab sauce and equally enjoyable. Best part is - no need to peel anything! The prawns were large and fresh. 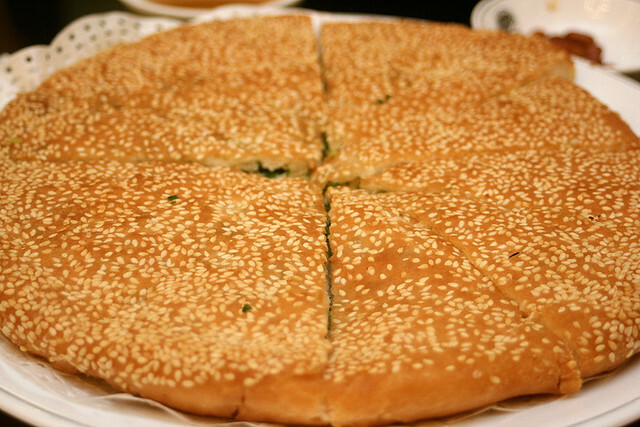 Giant fried scallion pancake! It was soft and fluffy inside but gently crisp on the outside. Our carb dish! These were really huge slices, but I finished it. Oh, perfect with the prawns' chili sauce earlier too. 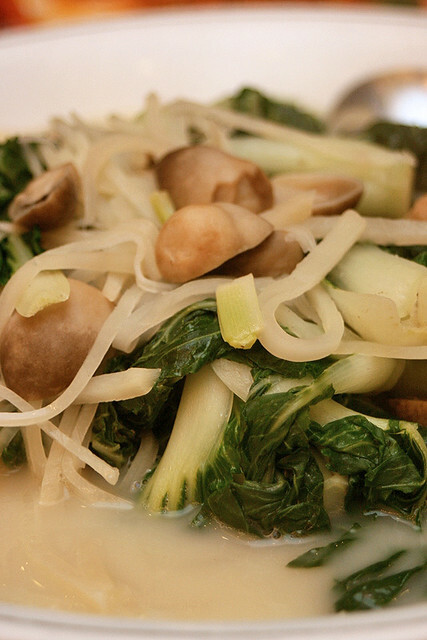 Nai bai (a type of chinese cabbage) with straw mushrooms in fish broth. I only ate the mushrooms, but the broth is light and clean-tasting. Fried yellow jack with sweet and sour sauce. By the time this came, I was already quite full. The fish was fresh, but the batter proved a bit too floury for me. But it does absorb well the sweet and sour sauce. We had a short break thankfully, before dessert arrived. We were ready for this! Deep-fried ice cream like you've never seen it before! 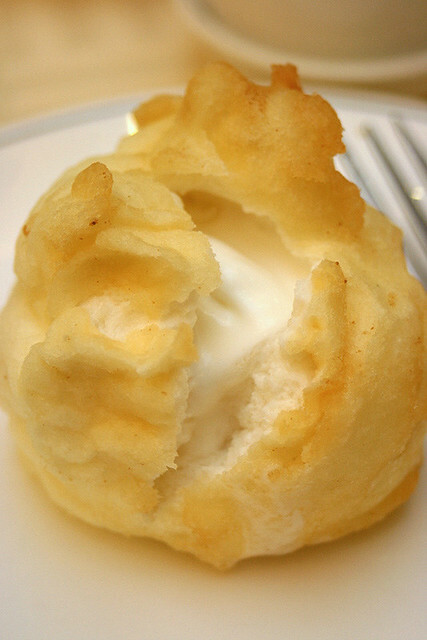 Pillowy soft batter encasing a firm dollop of rich vanilla ice cream. The batter is made with egg white for the colour, it seems. We were all going ooh and ahh eating this. We all enjoyed ourselves immensely. 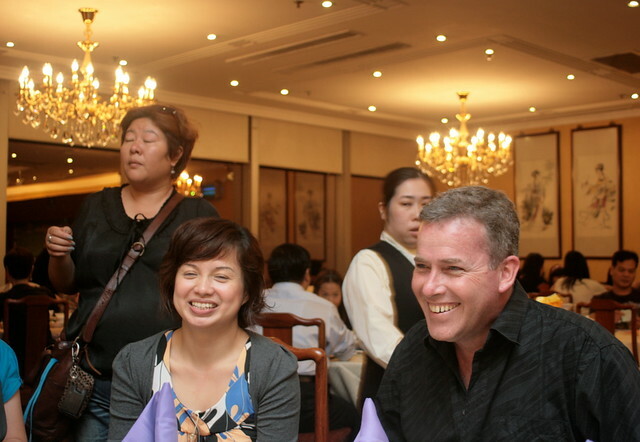 The multiple rounds of Tsingtao beer also helped enliven our spirits. When the fruit platter came, we also found out that Aussie Pete is allergic to ....*drumroll*.... WATERMELON! He could not eat any of the fruit. That is so bizarre! Now I really believe you can be allergic to anything. So ended our third day in Hong Kong (well, after some late-night shopping at Granville). 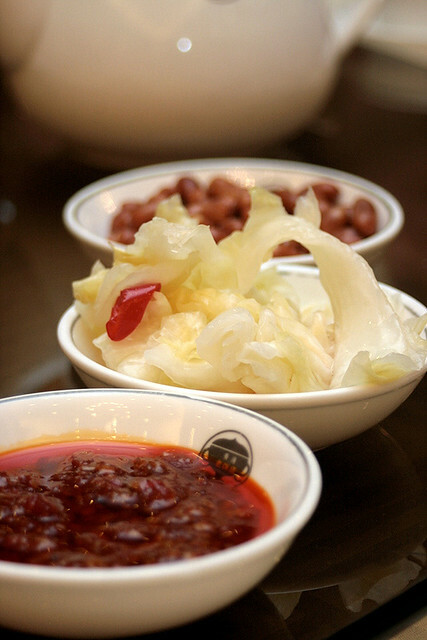 The next day we would meet Margaret Xu Yuan, Hong Kong's only female celebrity chef, at her private kitchen Yin Yang. 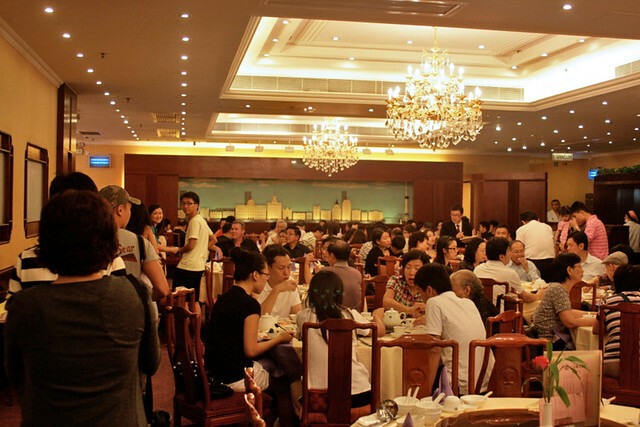 Thanks, HKTB, for the dinner and for introducing this place to us. Don't forget, you can win a 3D/2N trip to Hong Kong for two. 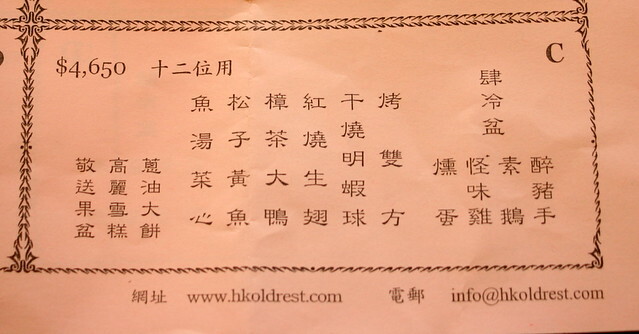 Just vote for your favourite blogger on the HK Summer Travel site. You can vote once every day, until 31 Aug.
ehehe I'm allergic to a whole bunch of fruits too, watermelon included. The runny eggs and walnuts looks unusual. I think i would love it though. Thanks for this recommendation. Think i will try this place come my next trip there...hehe. LFB: Yes, Kenny, I was actually thinking of you when I looked at those runny yolks. Would have gladly given you my portion! (^-_-^): oh my god...I can't imagine what that's like! 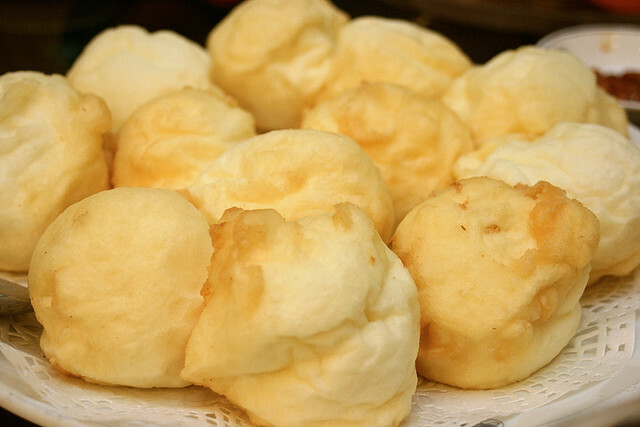 Stargirl: yes, but incredibly cloudy soft cream puffs. LJ: Thanks, it was a good dinner recommendation. All this food looks so delicious. I like cooking and experimenting new dishes very much. I would have liked to be there too. I can't imagine what taste has the fried ice cream.